No interesting cooking to report lately; at least, I’ve been cooking a little but nothing new, nothing I haven’t blogged about before. But on Friday I got to try Vegemite. One of my co-workers is from Australia and brought in a big tub for Australia Day, along with some bagels and cream cheese. So I tried it, and I kind of liked it. “Kind of” is the operative term here. Vegemite is clearly an acquired taste, but I think I could acquire it. 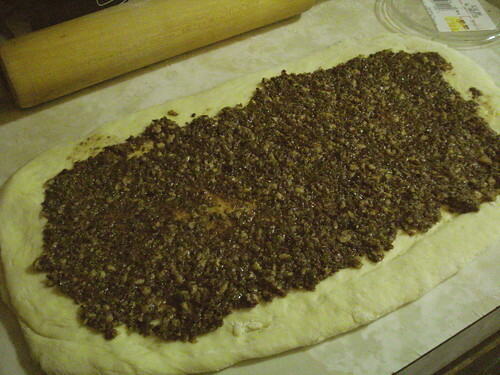 I spread a thin layer on a bagel; a little goes a long way. Vegemite is a thick, dense spread made from brewer’s yeast and vegetable ingredients. It has a very complex flavor: sour and tart, with a kind of underlying pungency. On the sesame bagel, the flavor was sharp and strong. 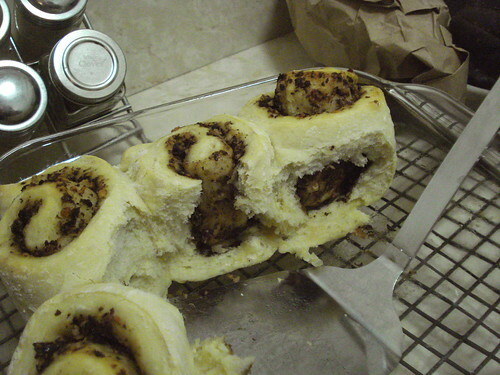 With a bit of cream cheese, the flavor was less challenging; the cream cheese added a different layer of tartness but also lessened the impact of the sourness, and the creamy texture made the Vegemite taste easier to handle as well. Nichole says that in Australia it’s most common to spread Vegemite on toasted wholemeal bread with butter, and I think the rich flavor and fatty texture of the butter would make the whole thing easier to process as well. Acquired taste is a funny thing. For most people, some foods are simply not enjoyable at first experience — coffee, for example. But for whatever reason — cultural pressures, a desire to feel grown-up and sophisticated, sheer morbid curiosity — we try the flavor again and become used to it, perhaps mixing in other foods to make the overall flavor more acceptable. Milk and sugar in coffee, soda water in whiskey, lemon juice in oysters. And eventually we acquire the taste. That said, a lot of our co-workers were not ready to acquire a taste for Vegemite. Which isn’t surprising; the American palate is far readier for sweet food than for bitter and sour ones, and Vegemite isn’t in our mainstream so there’s no cultural incentive to adapt to it the way one would to coffee. But if you have come to enjoy strong dark-roast coffee, or aged whiskey, or kimchi, you can probably bring Vegemite into your repertoire too if you give it a chance. So it’s finally really winter in New York. I tend to be very dismissive of New Yorkers and how much they whine about the weather. Ooh, it’s so cold out, they say when it’s 45, and I think, It’s January! It’s supposed to be cold! Get over it! And then we get a day where the temperature never rises above freezing and the wind whips down the avenues and I think, maybe I’m being too mean. And say, doesn’t chili sound good for dinner? I need to place a Penzey’s order. The Penzey’s that was in the Grand Central Marketplace has been replaced by some more expensive boutique spice shop, and my days of picking up high-quality spices at a low price on the way home are over. So I’m out of the really good chili powder, but as I browsed through my spice shelf I remembered that I have several dried peppers. Perhaps I could make up the deficit with those. I put a dried cascabel, a dried ancho, and a dried chipotle into my Pyrex measuring cup and poured on some boiling water, and let the peppers sit while I chopped up the rest of the ingredients. When I thought the peppers had soaked long enough I chopped them up; I discarded most of the seeds from the cascabel but kept them from the ancho and chipotle. I saved the soaking water (pouring some over the chopped peppers) in case I needed more liquid later. 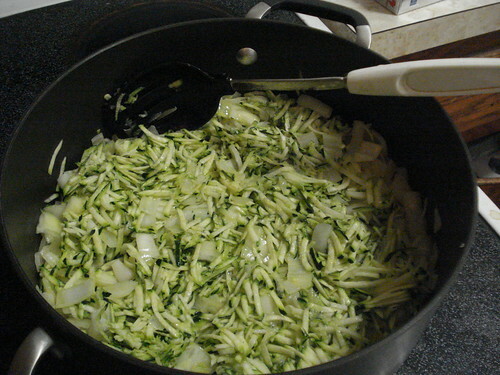 I browned some onions in olive oil, then added garlic and two small zucchinis, shredded. I sprinkled on some kosher salt and sauteed them for a while, until the zucchini was lightly browned and had cooked down quite a bit. 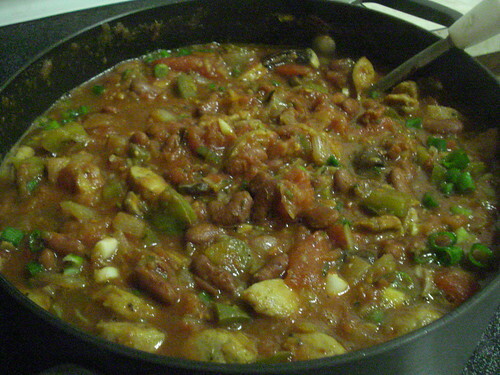 I then began adding my other chunky components: chicken sausage, mushrooms, green peppers, and kidney beans. For chili I like to use one large can of crushed tomatoes and one large can of whole tomatoes; I cut the whole tomatoes into chunks before adding them and their juice to the pot. I added the chopped chiles and a small amount of the soaking water, plus some lesser chili powder, some cumin, some coriander, and some epazote. I brought the pot to a simmer, covered it, and let it cook for about half an hour. When I uncovered the pot I steamed up my glasses. Ah, the joys of finally starting to wear glasses full-time at age 44! 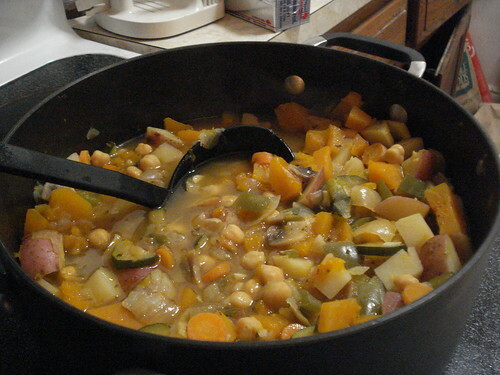 Once the steam cleared I stirred the pot and saw that the chunks were tender and the liquid had thickened slightly. The chili smelled rich and smoky, but not too spicy; I considered adding a bit of Tabasco but decided not to, thinking it would be fine without the added bite. I stirred in some chopped scallions and spooned up bowls for me and Scott. The chili was terrific; the chili peppers had given it a depth of flavor and a smoky tone, but not too much heat. (The chipotle was pretty small; maybe using two or three would have heated things up.) 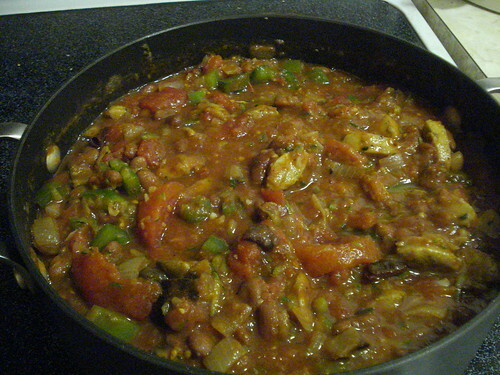 The slow simmering had taken the tart edge off the tomatoes and had allowed the shredded zucchini to effectively disappear into the liquidy base. We couldn’t really see zucchini shreds but we enjoyed the body they gave the chili. I’ll definitely keep using rehydrated dried peppers, perhaps experimenting with a few other varieties. And next summer I want to can some Greenmarket tomatoes for use in winter soups and stews. I’m probably not doing the cooking again until at least Wednesday. Scott is in charge of homemade pizza tomorrow, and on Tuesday night we’re having a party at the office to watch me compete on “Jeopardy!” That’s right: In November we went out to Los Angeles for taping, and have been sworn to secrecy ever since, but on Tuesday everyone will finally get to find out how my (first?) episode went. So tune in! 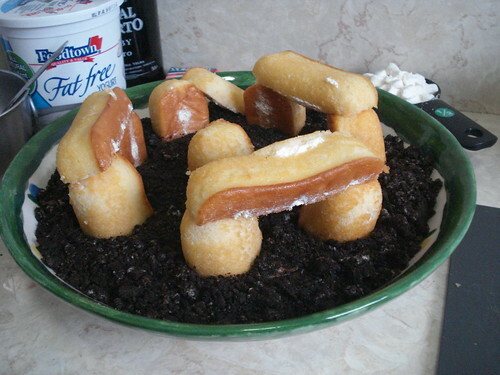 Hostess has declared bankruptcy. It sounds like the company has been struggling with debt, but that in the short term this is not likely to result in any interruption to operations. So you’ll still be able to buy Twinkies, Wonder Bread and other highly processed foodstuffs, assuming you care for that sort of thing. The NYT article strongly hints that labor and pension costs are a big issue, but if you’re getting into debt to the tune of $860 million there’s a lot more wrong with your planning than just paying your workers too well, I think. A lot of the coverage has been suggesting, possibly tongue in cheek, that consumers may want to stock up on Twinkies just in case the company ends up folding. I can’t get behind that, but use your own judgment. They don’t actually last forever — though I held onto the ones left over from my Twinkiehenge for over a year before finally discarding them and they didn’t look appreciably changed. But I didn’t taste them to find out. Just a short post tonight. Winter seems to finally be taking effect in New York — not like in the Midwest, no snow, only a few truly cold days, but still, cold enough for soup to sound like a good idea. Soup is also good for when you have a lean grocery budget, when you have a few leftovers you want to use up, and when you feel like you’ve been eating a few too many cookies and a few too many french fries lately. I think I’ve talked about my improvised vegetable soup here before: start with sauteeing onions and garlic in some olive oil, then keep tossing in vegetables so they are not so much browning in oil as steaming in their own moisture; then add broth and spices, bring to a boil, and let simmer until the biggest, sturdiest vegetables are appropriately tender. 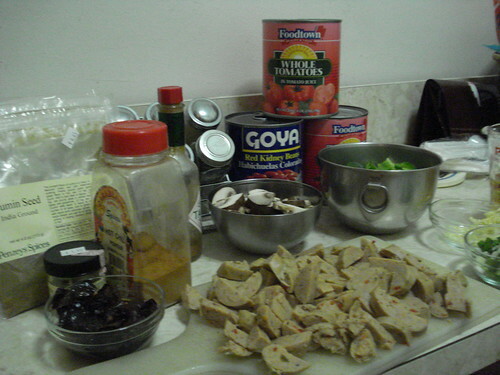 I thought the soup would go well with olive rolls — baking is also a good excuse to heat the oven on a cold day — but I found I didn’t have enough kalamata olives to make a paste, or enough time to go out and get more. So I dug through the fridge and found a jar of capers, and thought an olive-caper paste would do well enough. I threw in some parmesan that needed to be used up, with enough oil and olive brine and balsamic vinegar to make the mixture most enough to puree in the food processor. 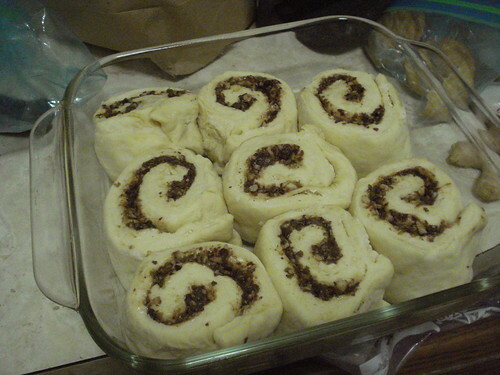 I rolled out my standard improvised bread dough — a slightly softer variation of pizza dough — and spread the paste on, then rolled it up in a spiral like cinnamon rolls. Well, sort of. I let the rolls have a short second rise while I preheated the oven and got the soup to the point of simmering, then let them bake for about 25 minutes. 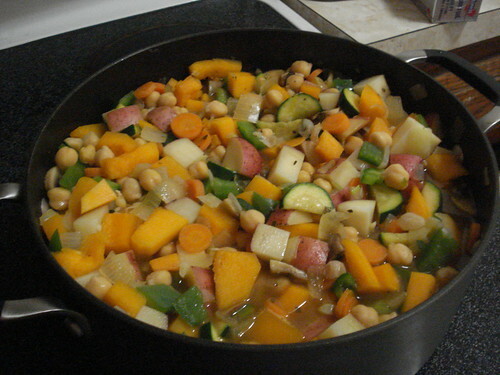 It made for a nice comforting dinner, with a savory vegetable-rich soup that felt substantial without being heavy. The rolls were a good complement; the filling had a little sharper flavor than the kalamata paste, but the cheese and the capers added a different kind of salty overtone to the olives. 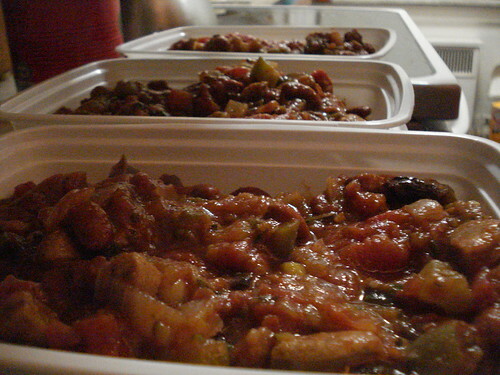 Plus I had enough soup left over to put a few servings in the freezer to be ready for a busier cold night. Happy new year! We rang in 2012 with sparkling wine (cremant de Loire, to be precise, very nice) and Chinese food delivered to our door by a cheerful young woman who I hope was raking in good tips for the evening. I know it sounds odd to talk about delivery on a cookbooks blog, which is exactly why I bring it up. I strongly believe that 99% of home-cooked food is better than 99% of restaurant-made or prepared food, at least in the price range that I can afford. Yet time and again we find ourselves getting Chinese delivery, takeout empanadas, deli sandwiches, and more. Well, OK, I also believe that 100% of deep-fried items that are prepared in a restaurant or industrial kitchen are easier to clean up after than 100% of deep-fried items I make myself. There’s that. Still, in the moment we make a choice based on convenience, or speed, or fatigue, and later I find myself second-guessing. Could I have managed it myself? (Not last night, I’m giving myself a break on that.) Could I have cooked something different that would have served our purposes? So I thought I’d make a few new year’s resolutions for myself and the blog — for myself, to be expressed on the blog as much as possible. 1. I resolve to cook at home more often. Now to accomplish that, I need to first make another resolution: I resolve to keep track. I can’t measure “more” if I don’t know what the numbers are. And if my perceptions are clouded by guilt, they’re not going be an accurate measure of trends. So for at least January I’m going to be making notes: What did we eat for dinner, where was it cooked and by whom, and why did we do it that way? Any interesting insights that come out of this will show up in posts. 2. 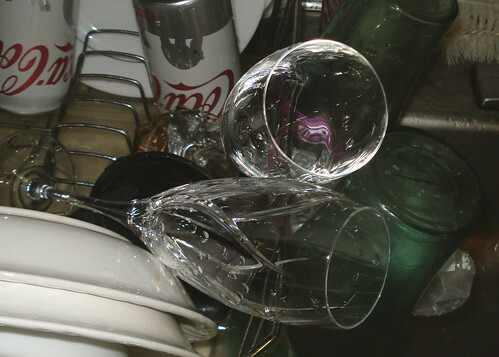 I resolve to keep up with the dishes. This is absolutely related to resolution 1, in that it’s hard to be motivated to cook even a quick meal at home if the sink is overflowing with last night’s messy plates and pots. But this is another area where perceptions are misleading, because I have noticed during the past few months that even a heaping sinkful does not actually take as long to wash and rinse as it looks like it will. Still, this is one of those jobs that’s easier to keep on top of if I don’t let things sit very long. 4. I resolve to stop waiting for conditions to be perfect. Those of you who are perfectionists know what I’m talking about here. I could try that thing if only I had all of Saturday free. I could figure this out if only I had the right cooking pan. There are some things that require the right tools or circumstances — canning non-acidic foods requires a pressure cooker, for example, which in turn requires a functioning pressure gauge, which means that’s not happening for me right away. Other things just need improvisation or a little more courage. 5. I resolve to post here more often, with shorter posts as necessary. I don’t always have time to cook a full meal, photograph it, process every photo and put it all together. But I can share my thoughts about what’s going on in the news, or take mobile photos of things I saw at a diner or a cafe. Not everything has to (or should) be a New Yorker essay. 6. I resolve not to beat myself up about falling short of the mark. I don’t think that one needs any explanation. If you don’t know what I mean, you’re only fooling yourself. What are your resolutions for 2012, cooking or otherwise?